Archer has a design which has a strong Medieval inspiration in its design, the theme’s focus being obviously on archery and the people that practiced it in the past. The look of the game is unusual for a Medieval themed title, using poker cards which seem to be sewn on cloth for example, but also images of women dressed correctly for the era, of warriors and archers that seem to be in the middle of a war. 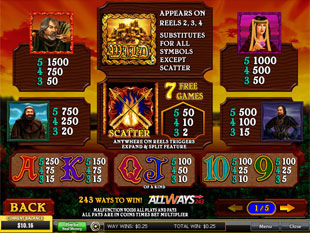 The slot was created by the developers that are working at Playtech. This Medieval themed slot comes with a modern system which has 243 ways to win. Prizes of $3,750 or lower can be won, and along the way you also get various free spins, scatter symbols, wilds and the very interesting Expand & Split feature. You have some features which are standard in it, like the wild, free spins or the scatter, but there are some that are highly unusual, especially the one called Expand and Split. Add some ways to win to this game, and you have a game that is worth a look. A system called All Ways is implemented in Archer. It has 243 ways to win, using them instead of paylines. The prizes tend to be lower in these titles, but the rewards come often, having the symbols on the correct reels being all that is needed to form combinations. You have the Gold Wild symbol as one of the features that you should pay attention to. Wild symbols in this game can appear on three reels only, the middle three. You can’t use it as a substitute for a scatter, but as usual it will work in every other situation, if it’s on the reel where it is needed. In order to gain access to the free spins of Archer, you need a Flaming Arrow scatter symbol to be on 3 or more positions in the game. 7 free spins are triggered if this happens. The Expand & Split feature is much easier to trigger here, not requiring a Flaming Arrow scatter to be present, but more about this feature below. You can retrigger the free spins, and 3+ Flaming Arrow scatters will add an extra 7 rounds to the feature. One of the game’s greatest features is called Expand & Split. The requirement for it to trigger in the base game is for one of the regular symbols to have an arrow border around it, while a scattered Flaming Arrow is also present somewhere. If the free spins are active, all that is needed is that symbol with the arrow border. The symbol which has the arrow around it will expand at this point, covering the entire reel. It doesn’t replace the other symbols though. It just splits them in half with a flaming arrow, so both of them are considered when combinations are formed. The bets you place here are used in multiples of 25, which are required in order to cover the 243 ways to win completely. The bet level starts at 1 and goes up to 10, allowing you to increase the number of coins per line. A maximum bet of 250 coins can be used, while the denomination reaches $0.25. That takes the wager to $62.50. Archer’s biggest payout isn’t exactly impressive, but that’s not the style of a slot with ways to win anyway. At 1,500x, that top prize is worth $3,750. While there is no doubt that it has a better Medieval design than some of the other slots with the same topic, it doesn’t look particular appetizing. The poker cards are to blame, showing up on too many positions each round, but that’s a problem that most slots share. Themed symbols generally show you archery related images, or various Medieval warriors or ladies. Symbols: Gold Wild (wild), Flaming Arrow (scatter, 50x wager), Robin Hood (1,500x), Lady Marian (1,000x), Friar Tuck (750x), Sheriff (500x), Ace (250x), King (150x), Queen (100x), Jack (100x), Ten (100x) and Nine (100x). A Robin Hood slot machine should be a good choice any day of the week, and since here you have the Expand & Split feature, along with the ways to win, it’s an especially interesting slot machine. I’m not a fan of the design though, so hopefully you don’t put too much value on that aspect. 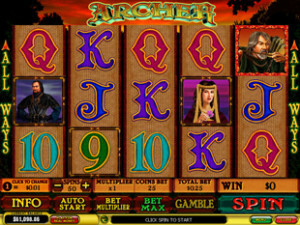 This Archer slot is offered by all online casinos with Playtech software, playable either in practice or in real money mode.